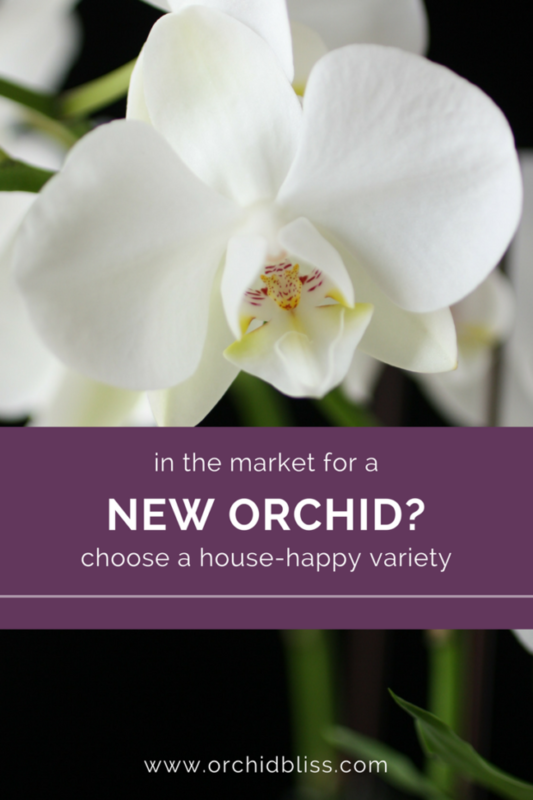 It just makes sense to buy orchids that will live happily in our homes. 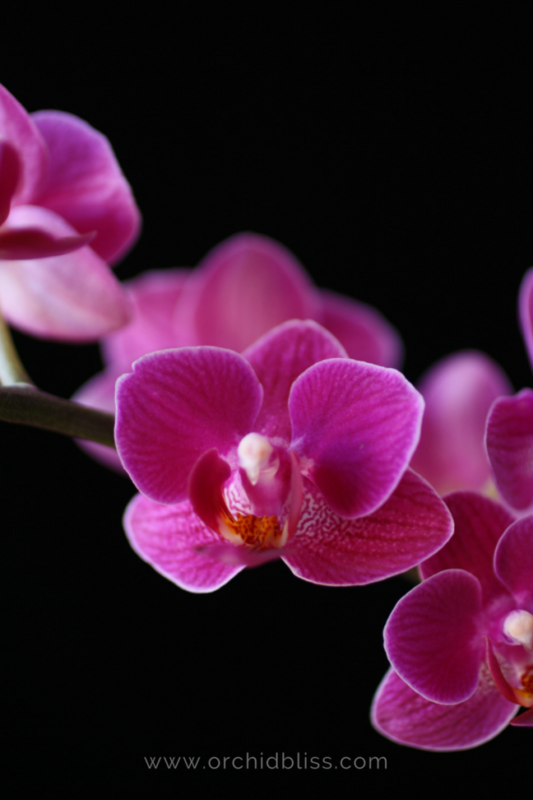 To that end, I have compiled a list of easy to grow orchids that make spectacular housemates. The purpose of this website is to help people, like you, to grow orchids in our homes without the necessity of a greenhouse. This means that I focus on the many amazing orchids that flourish in the same environment that we do. For example, I will not promote orchids that will shrivel up and die if they don’t receive 80% humidity. I call these easy to grow orchids that thrive in a typical home house happy orchids. I will receive a commission if you purchase through these links. 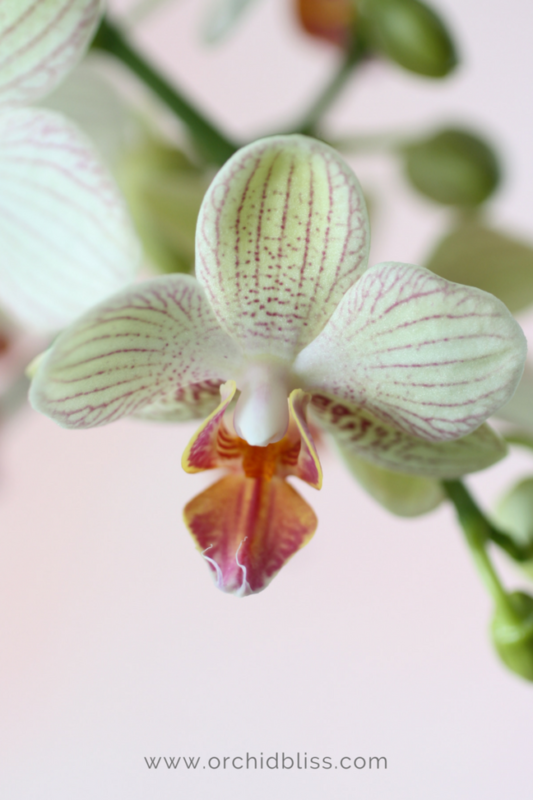 The easiest care orchid is the Phalaenopsis. This orchid is readily available at most grocery stores. And, little wonder, the blooms last for months and the stalk can be trimmed to encourage another spray of flowers. Miniature varieties are power packed with lots of flowers and usually multiple stalks. These plants are happy in a bright, preferably east, window. Before watering, let the plant almost dry out. Keep indoor temperatures between 60 and 80 degrees Fahrenheit. 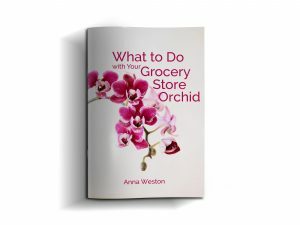 Check out my EBOOK: WHAT TO DO WITH YOUR GROCERY STORE ORCHID to learn how to care for you Phalaenopsis orchid. If you are looking for an orchid with lots of flowers, consider a Dendrobia Roy Tokunga. 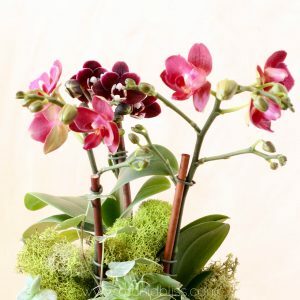 These orchids are graced with white flowers heavily speckled with purple and darker lips. The blooms will for three months, and each spike will bloom up to three times. After the blooms are spent, simply cut just below the last flower and wait for more flowers. Set this flowering powerhouse in an east window and water twice weekly when planting medium is almost dry. A couple of Dendrobium no-nos. First, they do not like to be re-potted. Only re-pot if you think you may lose the plant anyway. Second, they do not like wet feet. Do not leave in standing water. Remember these two rules and Dendrobiums are easy-peasy with incredible flower power. 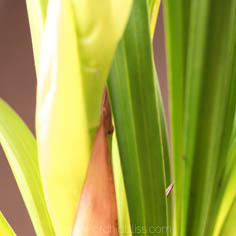 If you are looking for an easy to grow orchid that will fill the room with aromatic flowers, you’ve found it in the brassia. 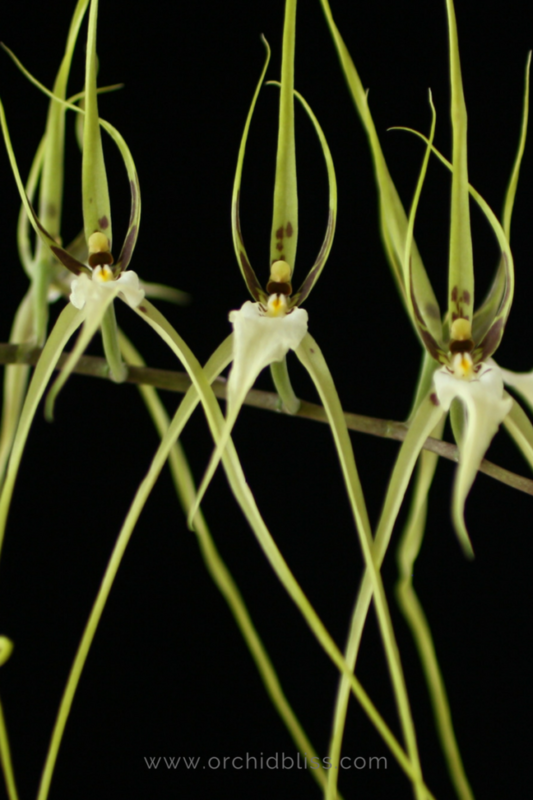 This flower is also called the spider orchid because the long, slender sepals resemble a spider. Water frequently when in bloom and less frequently when resting between bloom periods. 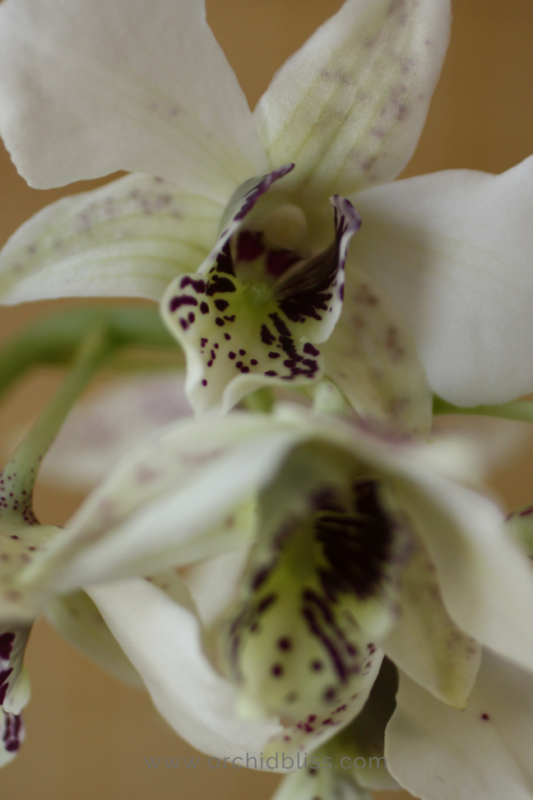 These orchids, like most others, prefer bright indirect light–such as that found in an east window. (Are you seeing a pattern?) A south or west window will also work if you have a sheer curtain to diffuse the light. The Brassia is an easy to grow orchid that blooms and reblooms like nobody’s business. BONUS: this orchid has a lovely fragrance. The paphiopedilum, or the lady’s slipper, is the most rewarding orchid I’ve grown. I love watching the large, unique bud slowly open. The large lip is extraordinary. 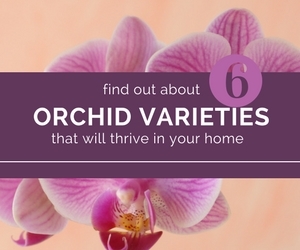 These orchids have lower light requirements and can be grown in any window. Be sure to hang a sheer curtain if growing in a south-facing window. There are many orchids that like to dry out between watering; the Paphiopedilum is not one of them. Keep your plant evenly moist. This is something that will come with practice. Unlike most orchids, the Paphiopedilum is semi-terrestrial and takes re-potting well. I love my Paphiopedilum; it’s totally exotic! If you don’t have a lot of light, grow a Paphiopedilum These easy to grow orchids doesn’t mind repotting and blooms once a year and many varieties have lovely dappled leaves. If you want large flowers go with a Cymbidium. These orchids are characterized by a profusion of large flowers and long, grass-like leaves. While writing this, mine has 4 flower spikes in bloom with 1 more on the way. Depending on the size of your plant, several bloom spikes will grow at once. 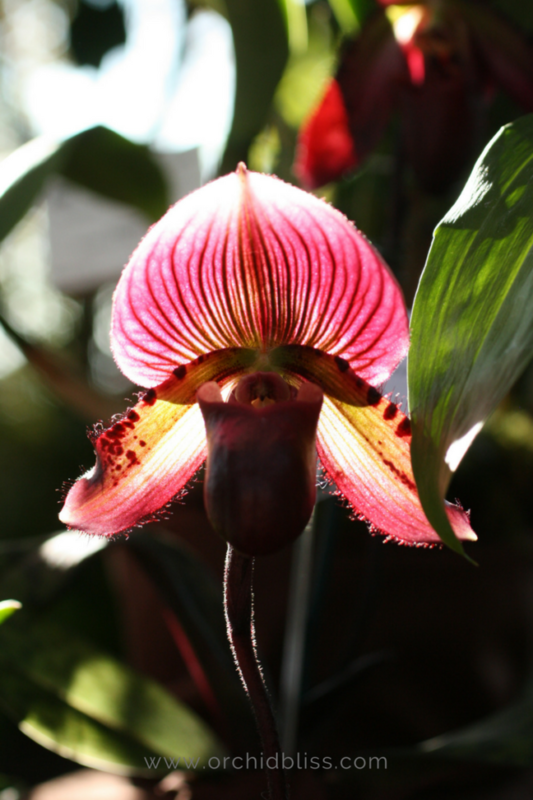 Like the Paphiopedilum listed above, cymbidiums are semi-terrestrial. 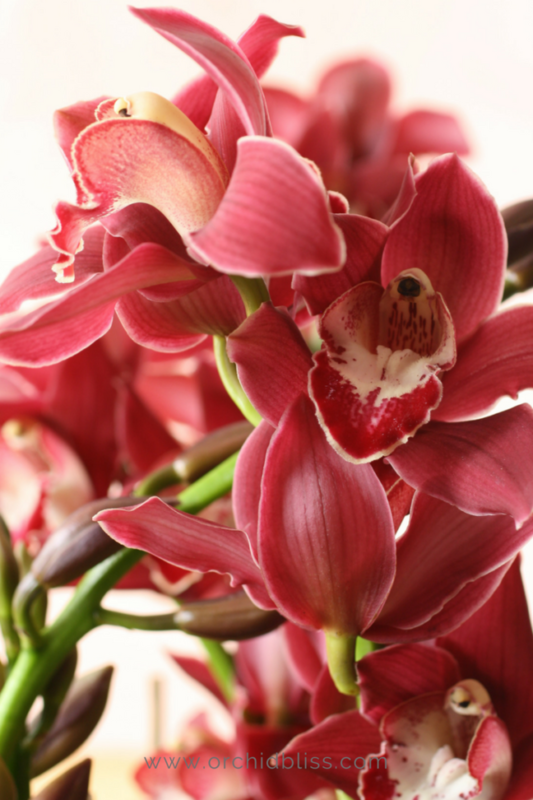 Most Cymbidiums available at the grocery store are the cold flowering variety. That’s why they are often seen at Christmas time. This is important when it comes to re-blooming. A drop in temperature is vital to trigger re-blooming. These plants can be brought outdoors for the summer and can stay out until the temperature drops down into the 40s. Be sure to bring it in before it freezes! Once indoors, the more light you can provide this baby the better. Enjoy the flowers in the winter, and, if you wish, bring it back outside in the summer. Cymbidiums are easy to grow orchids and easy to bloom if you remember one thing: make sure it gets a winter rest with temperatures down in the 40s F/4.4-7 C.
There are many varieties of oncidiums. 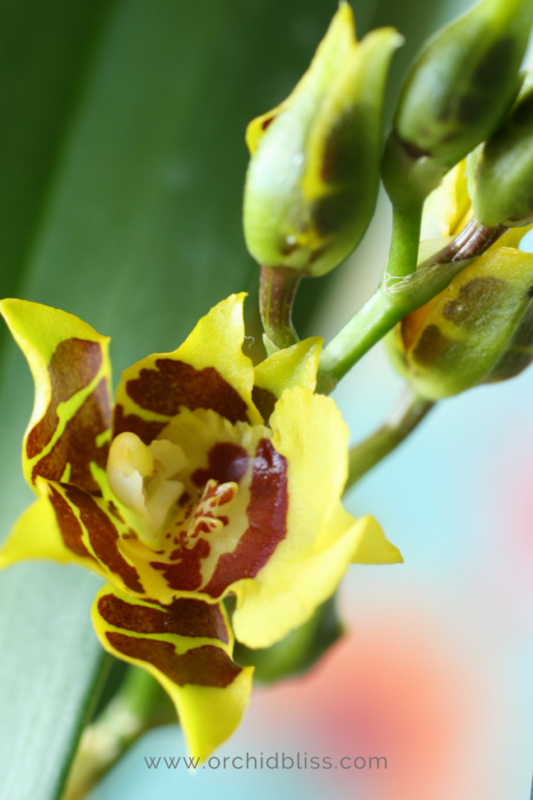 To be extra confident that the Oncidium is house happy, my suggestion is to ask-before-you-buy. Ask the seller if the variety you are interested in buying will thrive in your home or if it is better suited for the greenhouse. 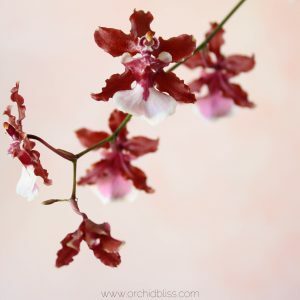 The fragrance from an Oncidium will fill a room. Some varieties will bloom more than once a year. 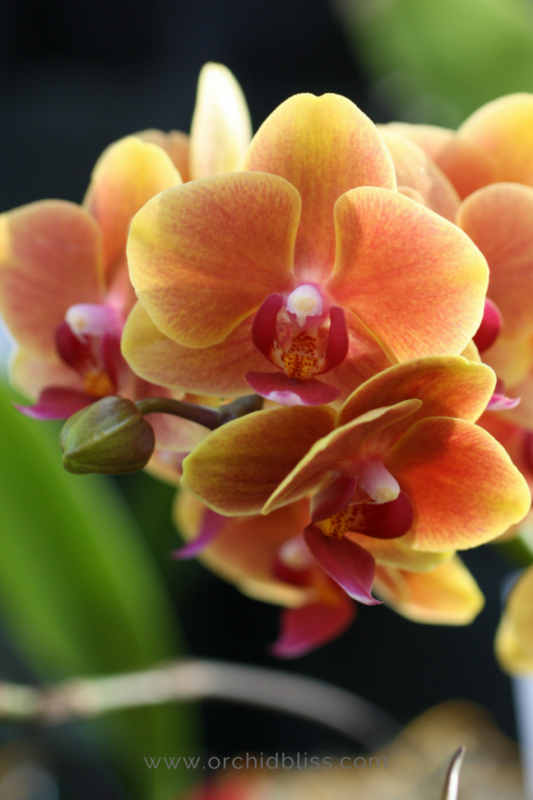 Now that you have some suggestions on easy to grow orchids, the next step is to select the healthiest plants. 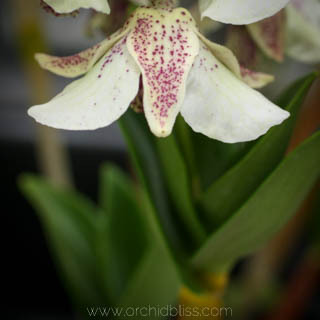 Check out my post on choosing an orchid. Have you had success with these or any other indoor varieties? We orchid enthusiasts are always willing to try something new. Please comment below to share your successes and failures with growing house happy orchids in your home. 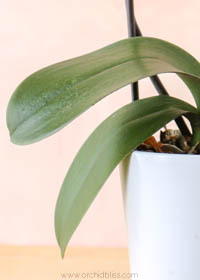 Yellowing Leaves Causing Problems for Your Orchid? Beautiful photos and very useful information! Thanks, Anna! I love orchids, but don’t know much…until now. So helpful. My lady slippers just finished blooming. They have survived for years on neglect. Wendy, Many orchids die from too much attention, aka too much water. Your approach is working well. I just bought an orchid with a ton of small blooms. It looks like an Oncidium. It’s just gorgeous as it happily blooms in my living room. Thanks for helping me figure out what I have! I love your pictures! They are so beautiful! Do you have suggested suppliers? Maybe an online source? I don’t know if I’ve see any other than the Phalaenopsis at stores near me. 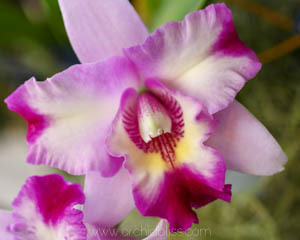 Thank you for all of your information about Orchids. It was very interesting and I plan to come and see you again. You answered a lot questions for me today. Thank you very much!!! See you soon. Thank you for your kind words. I’m glad I could help. Let me know if you have any questions. I am so sorry to hear your orchids were destroyed in hurricane Debbie. 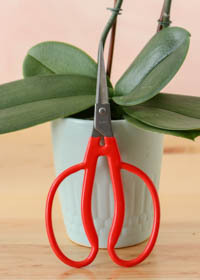 Here is an Amazon link to purchase orchid seeds. I have never grown orchids from seed, so I would love to hear how it goes. If you purchase through this link, I may receive a commission. 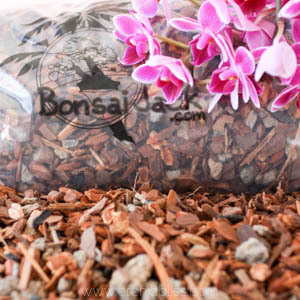 Creating a micro-climate with a clear, plastic bag can be very helpful as it will raise the humidity levels and help the plant grow more roots. You could also use a root stimulating fertilizer. Also, thank you for your kind words!